Recently, after reading a children's scientific book onVolcanoes and earthquakes, my son showed interest in volcanoes and began to ask me many questions. 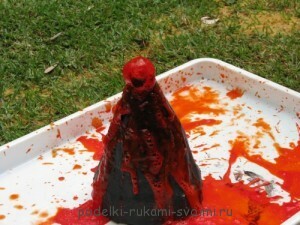 And we decided to investigate these issues and create our own volcano with our own hands. A home volcano is a very spectacular sight for children at any age, they observe and learn about the amazing power of these geological formations! 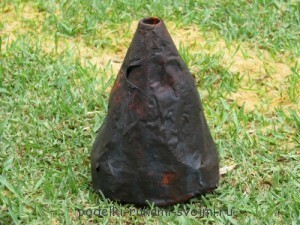 It is really very simple to create such an experience and create your own homemade volcano and this requires simple material that can be found in any home. 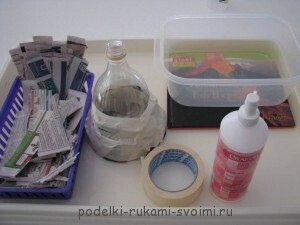 We need: Empty plastic bottle (1-liter bottle), newspaper torn to strips, PVA glue, adhesive tape, water container and glue mixture. 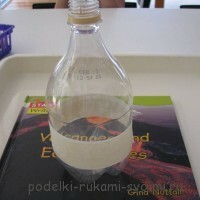 To make lava, to simulate a real volcano, we need bicarbonate of soda, red and yellow food color (or orange) and vinegar. 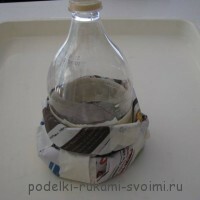 How to do: Cut out the middle of the bottle, and connect the bottom and top with sticky tape (tape), then give the bottle the shape of the volcano - wrap it in a newspaper and fix it with adhesive tape. 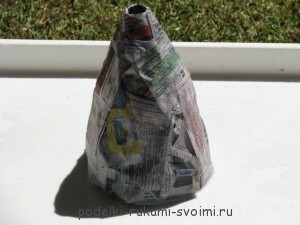 You can make a volcano of papier-mache (You need to rotate the layers of newspaper and flour with water (or glue), when the desired shape is ready, put it to dry). Let's paint our volcano. Lava - we used 4 tablespoons of bicarbonate soda and 1 cup of vinegar mixed with dye. We fall asleep into the bottle. 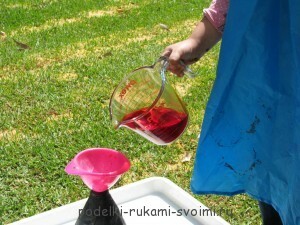 We pour colored vinegar and observe the miracle of "nature". Erupt magma is called lava. Volcanoes become larger, each time they break through, the lava cools and makes a new layer of rock. Volcanoes can break out under the water and form new islands from the cooled lava. 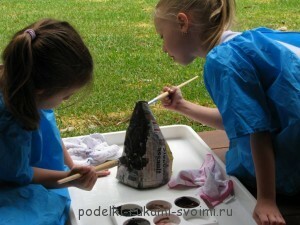 If you liked the experience - a self-made volcano, look also autumn experiment for children. How to make a box. Handicrafts from the boxes. How to just make a flower with your own hands. Ideas for cottages. How to make beautiful flower beds with your own hands. How to make a game yourself. Crafts for girls. Monsters for children with their own hands. How to make a bracelet of beads with the name of the scheme.